Blundering far-right fantasists the Scottish Defence League ventured down to Preston in mid-October for what promised to be a fun day of getting pissed and shouting incoherently about Muslims. Joining with their pals in the North West Infidels, they took to the streets of the Lancashire town – which has a sizeable Muslim population – for an “anti-refugee” protest. Not long after arriving in Preston’s Market Square, the SDL and NWI found themselves under a barrage of missiles and firecrackers from local youth. With the fascists quickly losing their tempers, they charged through police lines before suddenly finding themselves on the retreat, fleeing the square and abandoning a number of their flags and banners as they left. So it came to pass that one of the SDL’s banners fell into the possesion of Merseyside anti-fascists – along with one of the NWI’s flags. “A local skater kid confiscated a third flag, from a member of the so-called ‘Right Wing Resistance’ who’d decided to start a fight he couldn’t finish,” a MAFN member told this blog. 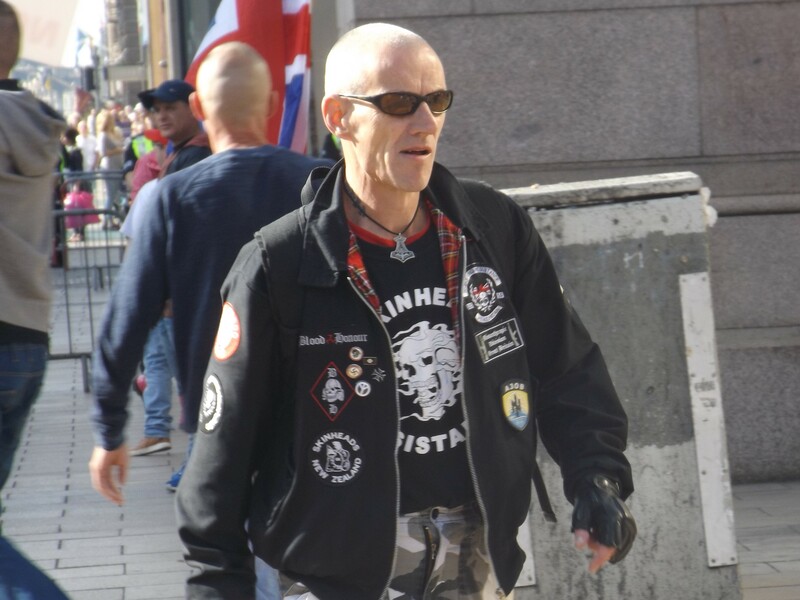 “The North West Infidels are a disgrace to Liverpool, so always mindful of our duty to public health, MAFN decided their flag was hazardous material, and incinerated it at the Pier Head,” they continued. That fate didn’t befall the trophy of the SDL banner though. After a recent anti-fascist conference in Liverpool, held in early December, MAFN decided to make it the centrepiece of the after-party, where it was hung upside down and had anti-fascist slogans daubed across it. Another glorious chapter in the history of Scotland’s street fascist movement. However, the events of October do point towards a worrying recent trend. “More disturbing than the flags, however, was what activists found in the backpack of Glasgow-based fascist Gary Crane. Gary got a bit clumsy and dropped his bag in Preston, which meant he also dropped his condoms, sedatives, zip-ties and facemask, which are – how can we put this? – not the kinds of things we’d normally pack for a day trip. We can only invite readers to draw their own conclusions, but it may be the case that Gary Crane is a threat to his local community in more ways than one. In light of the disturbing new cross-border activity between Glasgow and North West based fascists, MAFN have issued a call for stronger links between anti-fascists. 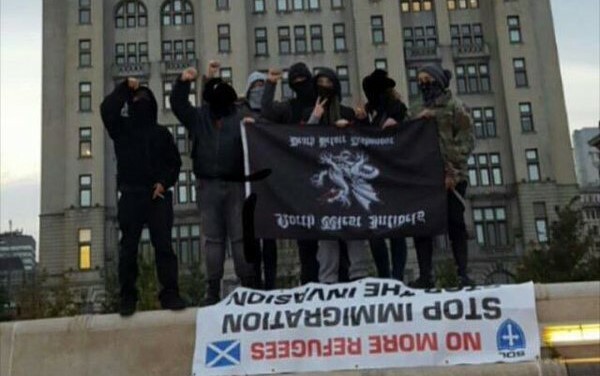 “We’d like to use this opportunity to highlight the fact that fash are still mobilising in and from Glasgow, in groups that haven’t been seen before. So we’d encourage closer links between activists in Liverpool and Glasgow – two proud cities with distinct cultural identities, as well as strong leftist traditions and outlooks that untie them. At a time when it can sometimes seem that racism, xenophobia and prejudice are on the rise in society at large, agitating and educating against the far-right is in everyone’s interests,” they said. Of course, this isn’t the first time that Scotland’s bumbling far-right have suffered the indignity of having a banner stolen. In 2010, the right-wing blogosphere went into meltdown after anti-fascists in Glasgow smashed up a BNP stall. A photograph of the BNP’s banner in the hands of anti-fascists later circulated online – much to their chagrin – leading to an arrest and prosecution. Some three years later, this resulted in a Not Proven verdict.